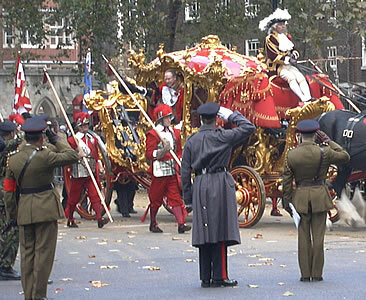 The Lord Mayor's Show is a procession which takes place every year after a new representative for the City of London has been appointed. 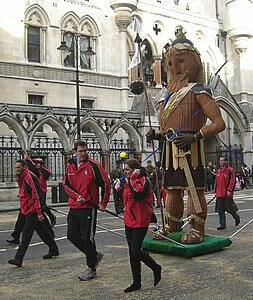 The tradition is about 800 years old. 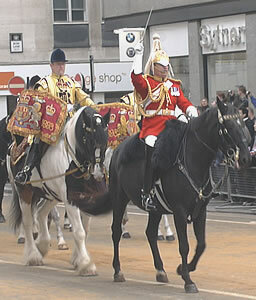 About 500,000 people line the road and cheer as the parade goes past. 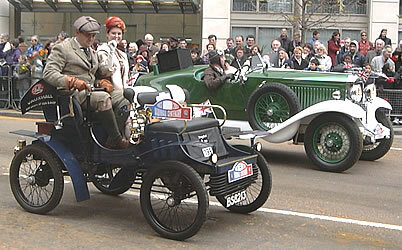 The event is also broadcast live on British television. 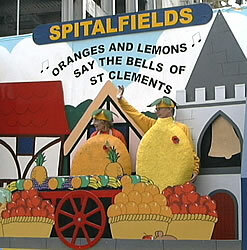 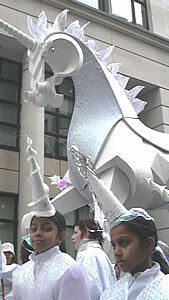 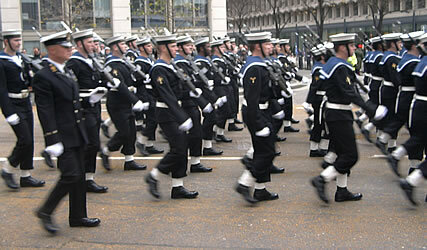 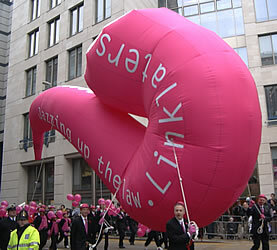 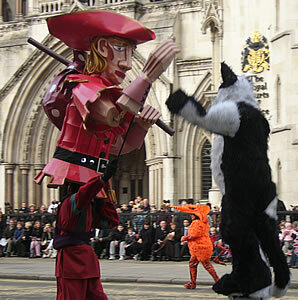 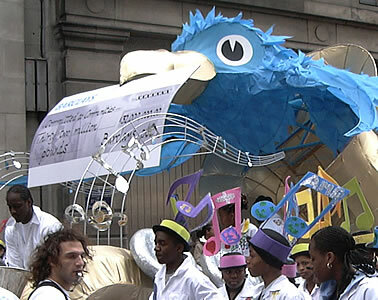 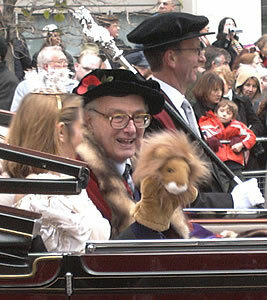 In 2011 the Lord Mayor's Show is on Saturday 12 November. 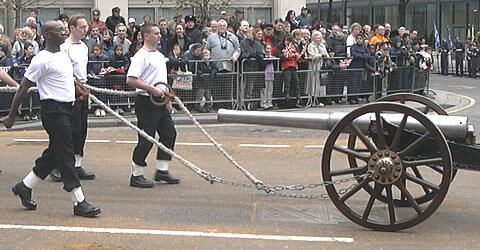 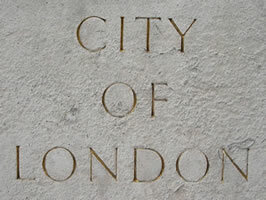 The show starts in the centre of the City of London (near the Bank of England) at 11am. 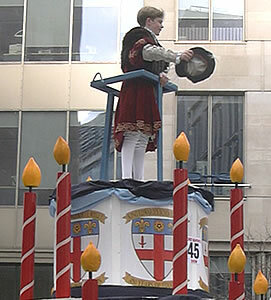 First, the mayor watches the street parade from outside Mansion House. 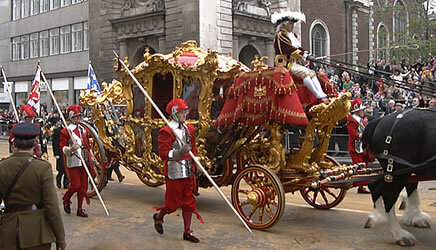 The Lord Mayor will later travel in the coach shown below. 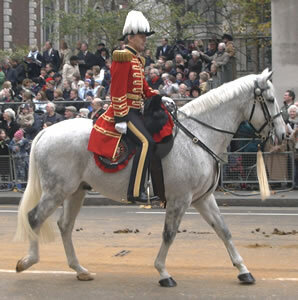 This was built in 1757, and is pulled by six shire horses. 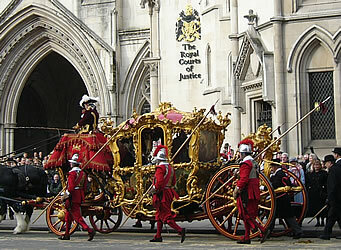 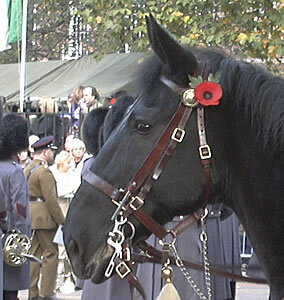 There are over 20 carriages in the procession - the only event which has more is a coronation. 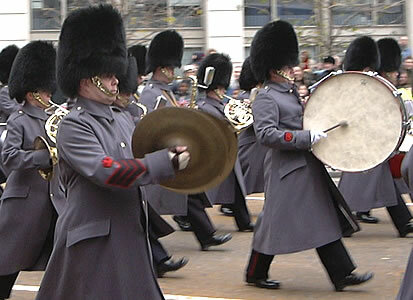 Bands from the Queen's guards provide part of the musical entertainment in the parade. 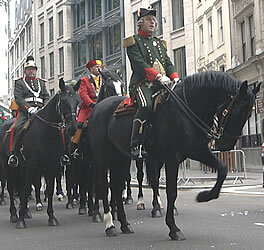 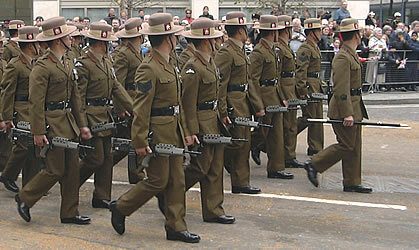 The Lord Mayor's Show is the biggest military display in Britain, involving over 2,000 soldiers. 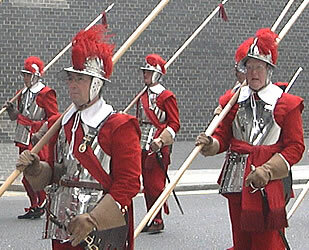 The second largest display is Trooping the Colour, a celebration of the Queen's birthday in June each year. 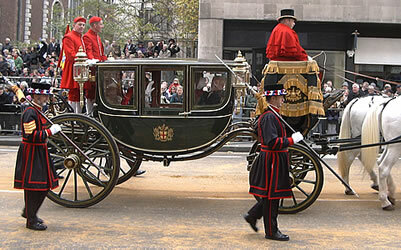 Over a hundred livery companies are represented - each one represents a traditional industry. 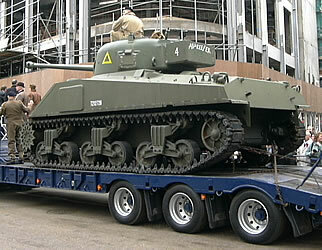 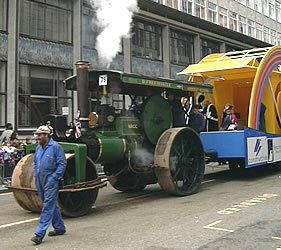 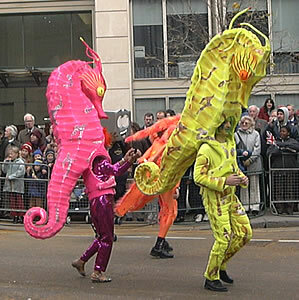 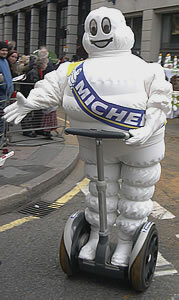 The vehicles used in parades such as this are known as floats. 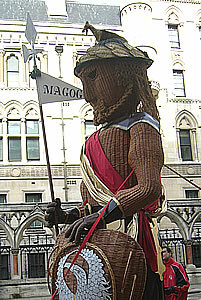 This is because originally the Lord Mayor's Show took place on the River Thames: the Lord Mayor and other representatives of the City of London floated down to Westminster on barges. 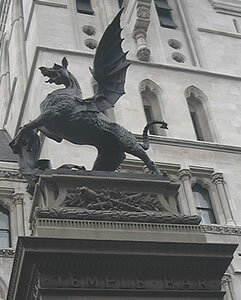 represented by "Adam and Eve"
The modern professions in the City of London - including banks and law firms - put on displays together with the charities which they support. 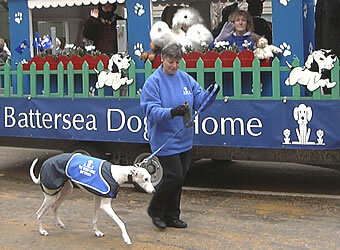 Animals are a popular theme in the parade. 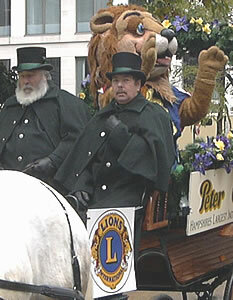 Some members of the procession travel by car. 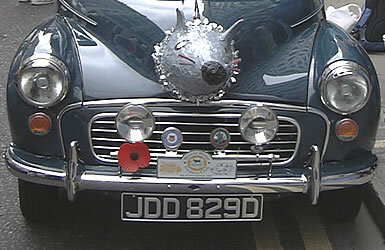 The "Morris Minors Owners Club" drive their Morris Minors, many of which are over 50 years old. 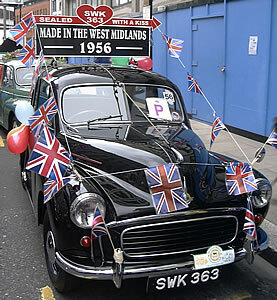 Cars were first produced by Vauxhall Motors over 100 years ago (Vauxhall is named after a place in south London). 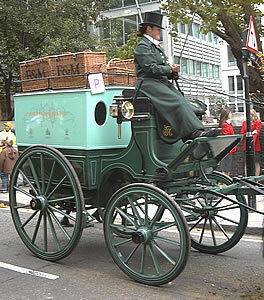 Back to the time of "Chitty Chitty Bang Bang"
Other members of the procession use alternative methods of transport. 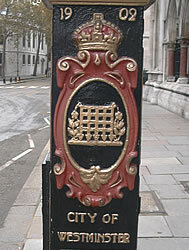 The Lord Mayor's coach arrives in Westminster when it crosses Temple Bar - the border between the "City of London" and the "City of Westminster". 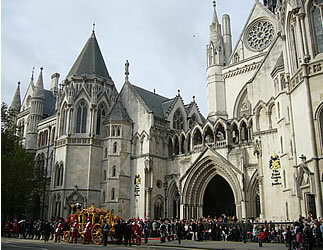 The new Lord Mayor goes into the Royal Courts of Justice to swear allegiance to the Queen. 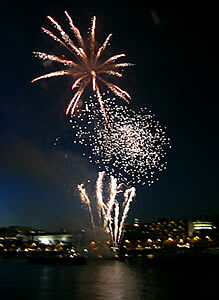 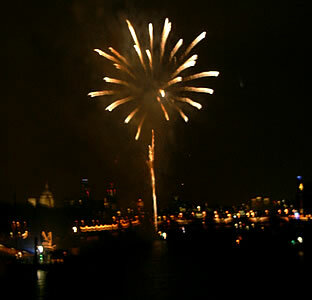 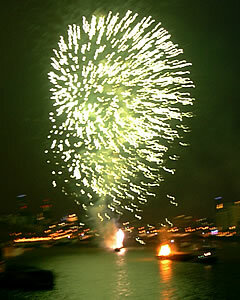 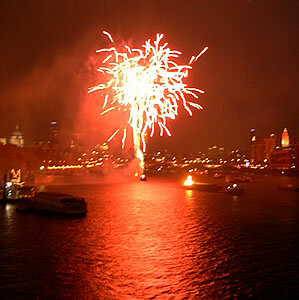 At about 5pm fireworks are launched from a barge on the River Thames (between Waterloo Bridge and Blackfriars Bridge). 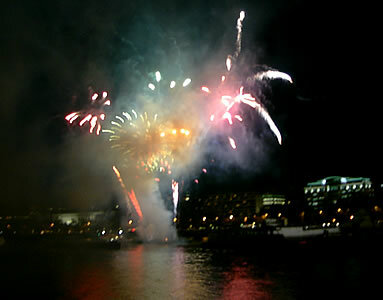 Spectators watch from the bridges and from along Victoria Embankment (north bank of the Thames) or Queen's Walk (south bank). 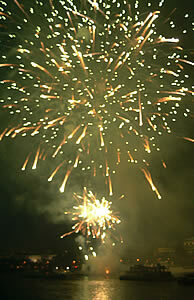 The display lasts about 15 minutes.